'Bohemian Rhapsody' had an incredible night at the Academy Awards on Sunday (24.02.19). 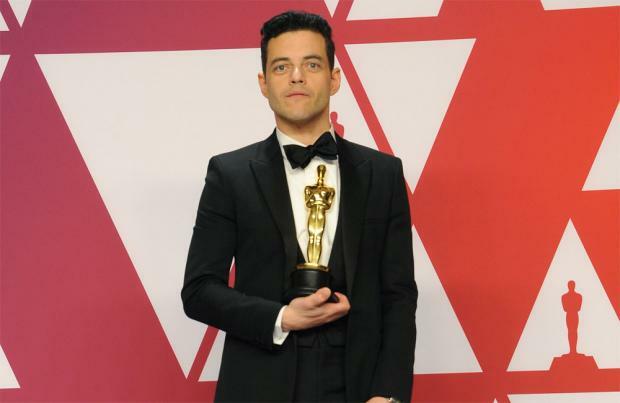 The Queen biopic took home four prizes at Los Angeles' Dolby Theatre, including the prestigious Best Actor accolade for Rami Malek, whose portrayal of late frontman Freddie Mercury saw him beat Christian Bale ('Vice'), Bradley Cooper ('A Star is Born'), Viggo Mortensen ('Green Book') and Willem Dafoe ('At Eternity's Gate') to take the honour. Accepting his award, Rami said: "I think about what it would have been like to tell little bubba Rami that one day this might happen to him and I think his curly-haired little mind would be blown. "That kid was struggling with his identity, and I think anyone struggling with theirs and trying to find their voice, a film about a gay man an immigrant who lived his life unapologetically and the fact I'm celebrating him and his story is proof we are longing for stories like this. "I'm the son of immigrants from Egypt, I'm a first generation American and part of my story is being written right now and I could not be more grateful to each and every one of you and everyone who believed in me for this moment, it is something I will treasure for the rest of my life." The movie also scored wins for film editing, sound editing and sound mixing. Elsewhere at the ceremony, 'Roma' and 'Black Panther' scooped three awards, as did 'Green Book', whose wins included the prestigious Best Picture gong. Picking up the honour, director Peter Farrelly said: "This story, when I heard it, it gave me hope and I wanted to share that hope with you because we're still living in divided times, maybe more so [now] than ever. "All we have to do, all we have to do is talk and to not judge people by their differences but look for what we have in common. And we have a lot in common. We all want the same thing, we want love and happiness. We want to be treated equally, and that's not such a bad thing." 'The Favourite' star Olivia Colman was named Best Actress – a feat she found "hilarious" and "stressful". As she took to the stage, visibly emotional, she said: "It's genuinely quite stressful. This is hilarious. I've got an Oscar. "Yorgos [Lamprinos], best director [on the] best film. Emma [Stone] and Rachel [Weisz], the two loveliest women to fall in love with. To go to work every day wasn't a hardship." Best Supporting Actor and Actress went to 'Green Book's Mahershala Ali and 'If Beale Street Could Talk' star Regina King respectively, while Alfonso Cuaron took home Best Director for 'Roma'. 'Green Book's third win came with Best Original Screenplay, while the Best Adapted Screenplay honour went to Spike Lee for 'BlacKkKlansman'. The ceremony was without a host but the evening kicked off with a performance from Adam Lambert + Queen and also included music from Lady Gaga and Bradley Cooper, Bette Midler, and Jennifer Hudson. Presenters on the night included Julia Roberts, Daniel Craig, Gary Oldman, Allison Janney, Sam Rockwell, Frances McDormand, Jennifer Lopez and Chris Evans.